On behalf of the New Mexico Section Local Arrangements Committee (LAC), we are excited to invite you to attend the 2016 Western District Meeting in Albuquerque, July 10-13. We’re hard at work preparing for your arrival as we plan a full schedule of conference activities including a robust technical program, fun networking opportunities, vendor exhibits, and family/social activities. Our meeting will be held at the distinctive Hotel Albuquerque in Old Town Albuquerque, where you will get to experience the rich culture, long traditions, and captivating landscape that makes New Mexico the “Land of Enchantment”. Visit our website to learn more. 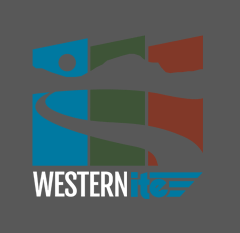 Whether you decide to fly or drive to New Mexico, come and learn about our rich transportation history! In anticipation of your questions about traveling to New Mexico, LAC Co-Chair Paul Barricklow has prepared answers to a few FAQs. 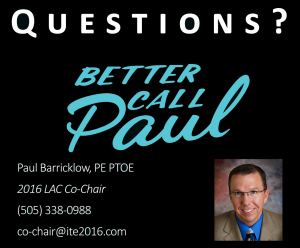 If you have any more burning questions about New Mexico…Better Call Paul! Isn’t New Mexico an unbearably hot desert in the summer? New Mexico has deserts and mountains and everything in between. July weather in Albuquerque is wonderful. Our average high is just 92°, and with the low humidity and 5,000 foot elevation, it always cools off nicely in the evening. You might want to bring a light jacket and an extra layer if you plan to visit the mountains. Do I need a passport or visa to travel to New Mexico? No passports are required for travelers from the U.S. who stay less than one month. Many businesses do accept Visa, as well as MasterCard and even American Express. Nearly all businesses accept U.S. currency at the exchange rate of 1:1.000. Will I be able to communicate with the local people in English? Most likely, unless your colleagues at work have trouble understanding you. Do I need to get any shots before traveling to New Mexico? That is not necessary. There are several cantinas in the Old Town area with a selection of fine añejo tequilas. Should I be concerned about scorpions and snakebites? Hey, if you’re into foo-foo drinks, we won’t judge you. What will separate this year’s meeting from last year’s meeting? Why is it called “New” Mexico? Actually, it’s not really new, and it’s not really Mexico, either. Go figure.